Dutch right-wing politician Geert Wilders has launched a website, inviting people to denounce Polish, Romanian and Bulgarian nationals causing 'nuisance' to the country's society. Sofia, Bucharest and Warsaw reacted with outrage. The EURACTIV network in Central Europe reports. Wilders’ Freedom party (PVV) has already gathered thousands of denunciations since it launched a website this week, asking Dutch citizens to report nuisance, pollution, problems related to housing or simply competition on the job market, caused by Europeans citizens coming from Poland, Romania and Bulgaria. PVV is the third largest party in the Netherlands. In the formation of the current cabinet of Prime Minister Mark Rutte, PVV's active participation resulted in the adoption of a "support agreement" between itself and the three coalition parties. Wilders’ party estimates that there are between 200,000 to 350,000 people from these countries living and working in the Netherlands. “Are they causing you problems? Or did you lose your job to a Pole, Bulgarian, Romanian or other Central of East European? We would love to hear from you,” reads the introductory statement on the website. PVV says it has fought from the beginning against the opening of the labour market to Poland and other EU nationals. Polish citizens have full access to the labour market of the Netherlands, while as newer EU members, Bulgarians and Romanians, will have full access from 1 January 2014. The websites says: "Do you have trouble with EU nationals? Or have you lost your job because of a Pole, Bulgarian, Romanian or other Central or Eastern European? We would like to hear. The Freedom Party has a platform on this website to report your troubles. We will check these complaints and submit the results to the Minister of Social Affairs and Employment." The launching of the site has stirred considerable emotion in the three countries mentioned. A spokesman from the Polish Embassy in the Netherlands said Wilders’ depiction of Polish workers as “polluting the Dutch job market” was insulting. The Embassy lodged a complaint about the site, but the Dutch ombudsman said he does not intend to consider the complaint because the actions of political parties do not fall within his competence. In Romania, the Foreign Ministry asked its embassy in The Hague to express strong disagreement and to request the country's authorities to take appropriate action, "in view of its discriminatory character, which violates European values". Vessela Cherneva, spokeswoman for the Bulgarian Foreign Ministry, said her country cannot accept that one of the founding members of the EU is tolerating incitement to hatred, discrimination and xenophobia, in contradiction of the EU's Charter of Fundamental Rights. Cherneva also asked the Dutch cabinet to differentiate itself from the party's initiative and undertake "the necessary measures". Asked to comment, Matthew Newman, spokesperson of Commission Vice President Viviane Reding, responsible for Justice, Fundamental Rights and Citizenship, said the EU executive was aware of the case and was going to publish its position. Workers from Bulgaria and Romania currently enjoy full rights to free movement pursuant to EU law in Denmark, Estonia, Cyprus, Latvia, Lithuania, Poland, Slovenia, Slovakia, Finland, Sweden, Hungary, Greece, Spain, Portugal, Italy and the Czech Republic. Restrictions remain in Belgium, Germany, Ireland, France, Luxembourg, the Netherlands, Austria, the UK and Malta. They typically require Bulgarian and Romanian citizens to have a work permit. As of January 2014 – seven years after their EU accession – there will be complete freedom of movement for workers from Bulgaria and Romania. Dnevnik, the EURACTIV partner in Bulgaria:?????? ???????????? ????????? ???????? ?????? ???? ????? ???????????????? I sent Mr Wilders a message through their nasty site that such xenophobia will not be tolerated. We are all Europeans, even the Dutch. The saddest thing is The Netherlands has a liberal prime minister, who considers it unnecessary to take any measures against this kind of racial hatred actions. Worse, he doesn’t even find it necessary to have an opinion on it. EU shall be a free open space. I desagre totaly with Mr wilders and all discriminative wilders however stop asking for sanction and ask education to dutch and also polish, romanian and bulgarian people to respect the freedom (the example must came from politicians). It seems as if Mr. Wilders can no longer attract enough publicity for his anti-Muslim statements, so he is looking for new groups to direct his hatred at. Shame on the Netherlands and on our prime-minister Rutte, who is a coward and doesn’t dare to say a word against this hate-mongering, afraid that his government may fall. He should stop blaming foreigners for the problems of the Dutch society, perhaps he should ask foreigners how ‘they’ feel about the Dutch…I think the answers would surprise many. The Dutch are liberal inasmuch as it is profitable. The Poles can never pollute Holland as much as the Dutchman’s own notorious and timeless greed. Kelly, among many Europeans the term Dutch is synonymous with greed. Ask the Indonesians what they think about foreigners in their country. Geert Wilders is a brave and skilful politician, I admire his honestry and clear vision, his understanding of the superiority of Western Christian culture, and his upholding of true liberal values as such were exemplified in the Netherlands and the UK in the late 19th century, and long may be labour before the true meaning of the word ‘liberal’ is recaptured for all right-thinking peoples of the world. I agree with him. These people should return home and solve their own country’s problems. One problem: high birth rates. to be fair, the polish and romanians do cause problems. A few days ago, BBC reported up to 500,000 romanian gypsies begging on streets of london, illegally. They use their children as their main source of income, it’s disgraceful and then, their pimps build villas back in Romania, its really bad. Also, most of them speak little or no English. And im pretty sure they speak NO dutch in most cases either. This is not a racist comment of any kind, simply how things are! Nationalism, discrimination, eugenics, hatred, and xenophobia do not have place in one of the founding members of the European Union. I am really worried as to where EU is going. I’m from Bulgaria. And just to surprise you all, that me and many of my friends agree with Willders, that foreigners make a lot’s of problems in NL, as obligations from social system and so on, but unfortunatly you didn’t see the differense bitween bulgarians and gypsies. And the problem is not with bulgarians or romanians, but with gypsies, they do all the crimes in NL or GB. Every white country on earth is supposed to become multicultural and multiracial. EVERY white country is expected to end its own race and end its own culture. ll this immigration and intermarriage is for EVERY white country and ONLY white countries. But what happens if what Wilders says is true or rather if the dutch people who respond do indicate that the nuisance value caused by these foreign nationals is disproportionate to their numbers as a percentage of Holland’s population? ?????? ???????? ?? ?????? ?? ?????? ??????? ???????? ?? ?? ??????????? ???????? ????????? ????? ?? ???????????? ????????????? ? ?? ??????????? ???????? ??? ?? ?????? ? ….. ??????? 157 ?????? ( ???? ????? ?????????? ?? ???? ?????? ?? ???????) ?? ?? ???????? ?, ?? ???????? (??? ???? ? ????? ??????? ? ?????????) ? ???? ?? ??????? ?????????? ??????? ????????? ?????? ???????????? ??????? ? ???? ???????? ?????? ?? ?????? ????????? ! ??????? ? ????????????? ???????????? ? ???????? ???? ? ??????? ?, ?? ??????? ?? ???????? ?????????????? ???? ??? ?? ??????? ?????????? ?? ???????? ? ??????? ? ?????? ??? ??????? ? ?? ? ??????? !!!!! ????? ???? ?????? ????? ????? ?, ?? ??? ?????????? ? ?????????? ?????? ???????????????? ? ???????????? ???????? This dude is a frustrated dandy. He’s just looking for a scapegoat regards his country’s nuisance, pollution, and other problems. Or he simply wants to increase traffic on his website… He is a politician with no vision at all. I blame his hate, racist remarks, and his xenophobic “project”. However CEE countries don’t need your filth anymore. Mr. Geert Wilders , your attitude is a mistake. When you found EXPORT opportunities to the CEE countries, then it was ok for us to buy your cancerous foods & beverages full of artificial sweeteners, colour stabilisers, additives , chemicals, etc ,etc. wasn’t it????? 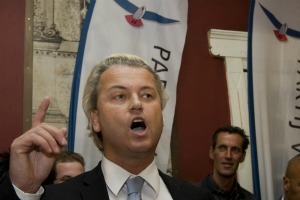 Mr. Wilders, you should know that the nuisance is mutual . EU is a a ticking bmb waiting to go off! Gypsies are not Romanians. People get your facts right!!! !